Due to the relatively short growing season here in the Willamette Valley, fruit jams and jellies have become an important aspect of our local food culture. Even in the middle of winter, fruit preserves have the ability to evoke memories of warmth and sunlight, while preparing us for the sweet flavors of summertime to come. Carl & Nancy Hendricks and their children represent the fifth consecutive generation to continue their family's rich tradition of farming in the Willamette Valley. They grow several vegetable and fruit crops on their farm, which are sold at local farmers' markets and featured on restaurant menus throughout the area. Fresh To You Produce has created a line of fruit syrups and jams that highlight the delicious fruit grown on their farm. Since 1929, E.Z. Orchards has been growing some of the finest fresh fruit the Willamette Valley has to offer. Today, E.Z. Orchards grows several varieties of apples, pears, and peaches. Their farm market, located at the corner of Cordon Road and Hazel Green Road, carries a wide selection of local grocery items, along with their private label fruit preserves. E.Z. 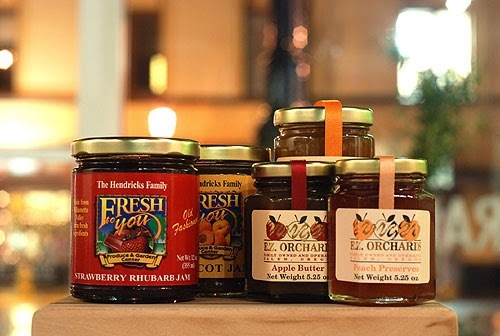 Orchards grows their own fruit for their Apple Butter, Pear Butter, and Peach Preserves, while the Pumpkin Butter and Marionberry Preserves are made with produce from other local farms.